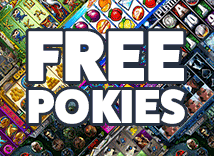 Games with 243 ways have been a hit with pokie players ever since Aristocrat released hit games like 5 Dragons, Indian Dreaming and Wicked Winnings. The format literally gives you 243 ways to win on each spin and has the added advantage that a small bet can cover all possible ways. The 243 Ways format was made popular by Aristocrat in the 1990's with games like Indian Dreaming, Pompeii and 5 Dragons. One of the biggest reasons for this popularity is the fact that the games have high hit rates and give you a lot of different chances to win on every spin. In recent years we've seen game developers both online and offline embrace the format and even take it a step further with games being released with 720, 1024 or even 3125 ways. How Do 243 Ways Games Work? Instead of having to line up symbols on lines you win as long as the correct symbols appear in any position on the screen aligned left to right. While 243 might seem like a bit of an odd number it is in fact defined by all of the possible combinations on a 3 by 5 reel layout (3 x 3 x 3 x 3 x 3 = 243). Adding extra symbol positions to any of the reels increases the amount of possible ways. For example a 4 by 5 layout gives 1024 ways. The biggest advantages of all ways games are the fact that you have lots of ways to win on every spin and the fact that you get all of the different ways with a relatively small bet requirement.